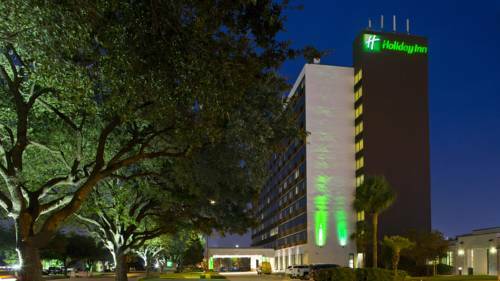 Our newly renovated Houston Medical Center hotel is the pride of South Houston. Located next door to NRG Stadium and NRG Park, our hotel is just off 610 loop. Just minutes from downtown, Minute Maid Park, Museum District and the George R. Brown Convention Center, we offer top convenience and comfort. The Texas Medical Center is less than two miles away and the hotel offers daily shuttle transportation to all of these medical facilities, including the acclaimed MD Anderson Cancer Center. The popular Houston Museum District is just minutes from our Houston, Texas hotel near Hermann Park including the Houston Zoo. Our hotel in Houston offers spacious Houston hotel rooms and suites with plenty of room for the whole family. Top hotel amenities in our recently renovated guest rooms include mini fridges and microwaves in all rooms and work areas with premium business features. Each of our newly renovated rooms offers complimentary wireless Internet, complimentary local and 800 calls and complimentary parking. Over 2,300 square feet of meeting space and event facilities are available for business meetings, baby showers, family reunions and special events. Our Houston Hotel is adjacent to the NRG Stadium and features a private entrance into the stadium area. Our Sidelines Bar is open from 4:00 pm to 12:00am. Sidelines offers casual dining options until 10:00pm nightly, and bar service until 12am. Happy hour drink prices offered from 4:30pm to 7:00pm. The world famous Galleria Mall is just minutes away from our hotel. MetroRail from Reliant Park/Center to Medical Center, to Rice University, to Museum District, to Downtown Houston. Public golf course near everything. Fun and easy-going golf experience for good price. SMG-managed property includes NRG Center, the home of the Houston Texans and their large convention center, OTC, BBQ cook off and Rodeo, Nutcracker, Boat Show, Gem and Jewelry, and much more takes place here annually.